The Girl Downstairs:So it's you. I might have known. You've not only annoyed me at work and on the street, but you're keeping me from sleeping. Keaton had sunk to his lowest depths just before these films were made, after making some of the greatest comedies ever to grace the screen. In the wake of a nasty divorce from Natalie Talmadge, Keaton got a well-deserved reputation for being an unreliable drunk, and he was widely considered completely washed up by 1934. After making a few unsuccessful pictures in Europe, Keaton returned to America where he got a contract making short films for Earle W. Hammons' Educational Pictures, a studio that made Poverty Row look like Main Street USA. Filmed in a couple of days for a few dollars, these shorts did have the merit of allowing Keaton to do his thing with relative freedom from interference; as long as the films were finished quickly, cheaply and with a minimum of trouble, Educational didn't seem to have much to say about them. As a result, some of these shorts are a good deal better than Keaton's MGM films, which were subject to a good deal more studio interference. The sixteen shorts cover a period of about three years, and inevitably we find Keaton borrowing from his silent-era work. The last picture repeats several gags from his first film, The Butcher Boy, made for Arbuckle in 1917. Some of the stories feel a little rote, with Keaton (invariably as a sad sack character named Elmer) competing with some wealthy oaf or good-looking socialite for the hand of the girl. Keaton was no longer a young man, so these plots stretch the patience a little, but he still makes do with what he has for scripts and decorates the barren spine of the tale with plenty of comic gems. The ridiculousness of his situation is pointed up in Three on a Limb, in which Keaton is dressed in a ludicrous Boy Scout uniform while he tries to impress the ladies. In the first short, The Gold Ghost (1934), a particularly fine sight gag about a game of cards with an incredibly dusty deck isn't germane at all to the story but it definitely inspires plenty of laughter. The best pictures in the set are those that reflect Keaton's own interests: One Run Elmer, which centers on a local baseball game featuring many stunts culled from the charity Hollywood baseball games Keaton helped arrange. Grand Slam Opera is one of the best in the set, showing off Keaton's skills as a juggler and a dancer (he even does a Fred Astaire impression). Several themes are repeated, such as the demolition of houses, and the pursuit of the female. But there's never a sense of being repetitive, even when the shorts are seen together in short order. Given his background in silent comedy, it should be no surprise that there's not a lot of humor derived from the dialogue and the best segments are almost entirely silent. These include the baseball game in One Run Elmer and long sections of Blue Blazes, among others. The war of dialogue and silent comedy is at its best in Grand Slam Opera, as Keaton absurdly tries to be a juggler on a radio show. The supporting casts are frequently of interest; Dorothy Sebastian, who co-starred with Keaton in Spite Marriage some years before, makes an appearance here shortly before her retirement. Keaton's family makes two appearances, with their line delivery in Palooka from Paduch being particularly painful. Clearly their old vaudeville act wasn't dependent on credible recitation of dialogue (primarily it consisted of Father Joe Keaton hurling young Buster around the stage). Bud Jamison and Vernon Dent, who would be foils for the Three Stooges, make prominent appearances here, as does Keaton's old co-star in the Arbuckle comedies, Al St. John (who would go on to be a western sidekick in 1937, the same year as his appearance here in Love Nest on Wheels). Even Mack Sennett of Keystone Kops fame gets into the act as director of The Timid Young Man. Video & Audio: As orphan films, these shorts are predictably not in the best of condition. There are a number of tears and jumps that indicate significant chunks missing (most noticeable in Allez Oop, from which there's clearly a substantial piece missing since we go immediately from Buster having lost his tickets to the circus, to being at the circus with the love interest (Sebastian). Beyond that, however, these are reasonably attractive prints with modest speckling. Greyscale is excellent, since these are fine-grain or early generation prints from Keaton's own collection for the most part. The audio is pretty noisy and hissy, with the dialogue nearly getting drowned out at times. But absent a major restoration effort, this is about as good as these pictures are likely to get. Extras: There's not a lot here, although David McLeod provides substantial notes on each of the films (though he seems to be unaware that the final gag in Ditto is a reference to the Dionne Quintuplets). Disc 1 includes a small photo and poster gallery with about two dozen images. Why They Call Him Buster is a short selection of pratfalls from these pictures set to music. 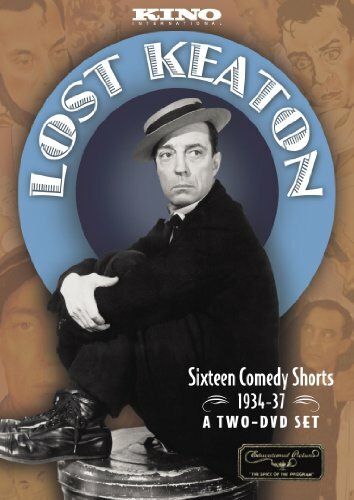 But the star of the show is Keaton himself, and this set is sure to be a treasure for any fan of Buster.